No Ellie for me today, as it is a catchup week. Recently, it was Mara's birthday, and she requested a from scratch tarte tatin. I had some lovely pears in the house, so I decided to make her a pear tarte tatin for her birthday. I used this recipe from Taste.com.au. Instead of ready rolled puff pastry, I made a single batch of Nick Malgieri's quick puff pastry. Mara said that she loved her tarte tartin, as did her family. She especially loved the caramelised bits on the pastry. I'll have to take her word for it, as I didn't try it, but I am happy that she enjoyed it. This week's Wednesday with Donna Hay is a catchup week. I have nothing to catch up, so I am instead posting a Donna recipe that I made some time ago but not yet posted. In a recent edition of Donna Hay magazine, Donna published a delicious looking recipe for Caramel Popcorn, Almond and Malt Cookies. I subsequently found that the recipe is also published online here. I decided to make these cookies because I still had heaps of malted milk powder left from this cake, and I had leftover Lolly Gobble Bliss Bombs from this Dorie recipe. It seemed that these odds and ends were custom made for Donna's cookie recipe. I just used roasted unsalted almonds and it was fine. These cookies were very simple to make and tasted delicious. I don't think I'd run out and buy the ingredients especially, but if you have them on hand, it is a tasty cookie recipe to make. Tuesday with Dorie this week leads us to prepare Coconut Tapioca. I have never cooked with tapioca before - my only previous brush with tapioca was using it to fill a cushion we made at preschool. I have tried the tinned tapioca and that is gross, so I was a little hesitant about this week's recipe. However, I need not have worried - this coconut tapioca was absolutely delicious, although a little tedious to prepare because the tapioca has to be soaked for at least 6 hours before use. (I could only find small pearl tapioca which worked just fine.) Otherwise, the process to make it is very straight forward, and the finished result is delicious. I served my tapioca with lychees, because the smooth, sweet fruit offers a nice contrast to the thick, textured tapioca. To see what the other Doristas thought of this dish, visit the LYL section of the TWD website. One of my favourite things to do when I go home to visit my mother is to read all of the women's mags that she has accumulated since my last visit. As she is a reader of a weekly magazine, this usually ends up being quite a lot of magazines. I catch up on all the latest celebrity baby names, who's dating who and who is having a rocky marital time. I also love looking at the recipes in mum's magazines. There is usually something that takes my fancy, even if I never end up making it. Delicious - I am sold! I was a very bad person and tore the page out of the magazine to make the cake. It was worth it - the cake was a delicious light spongy confection full of mangoes and macadamia nuts, and topped with even more macadamias (I skipped the extra mango on top). Preheat your oven to 180 degrees Celsius. Grease and line a 20cm springform pan. Combine the flour and sugar in a large bowl. Stir in the cream, eggs, water, vanilla and lime zest. Fold in the mango and half of the macadamias. Scrape the batter into the prepared pan and bake for 50-55 minutes or until cooked through. Cool in the pan for 10 minutes before transferring to a wire rack to cool completely. To ice the cake, combine 1 1/2 cups sifted icing sugar, 1 tablespoon of lime juice and one teaspoon of vanilla essence, drizzle over the cake and top with the remaining macadamias. On our recent trip to Bendigo, Tim and I had lunch at Wine Bank on View, a wine bar and wine merchant which also serves food. It is situated in the very opulent former ANZ Bank Building - the building is a wonder to behold. This was a light, tasty choice. These sausage rolls were flavoursome and beautifully spiced - definitely not your standard bakeshop offering. Yummo - all of the elements combined on toast made for the perfect light meal. Wine Bank is a cool, soothing, atmospheric place to escape from the madding crowd for a bite to eat. This year is the centenary of ANZAC Day. ANZAC Day falls on 25 April every year, and honours Australians and New Zealanders who have participated in wars and peacekeeping operations around the world. ANZAC is an acronym for Australia and New Zealand Army Corps, who landed at Gallipoli on 25 April 1915 in World War I. Anzac biscuits were supposedly sent to the troops in World War I because of their keeping qualities. Although Anzac biscuits are "keepers", they are delicious - they are made from rolled oats, sugar, coconut and golden syrup, and smell like heaven. In honour of the centenary of Anzac Day, I made these Anzac biscuits from a recipe on p84 of the April 2015 edition of Taste magazine. I was not that happy with it - it uses caster sugar instead of brown sugar, the latter of which I feel gives the biscuits a lovely caramel flavour, and the butter stated was not near enough to roll the batter into balls. Looking at other recipes, it seems that the ratio of dry ingredients to butter was slightly off. 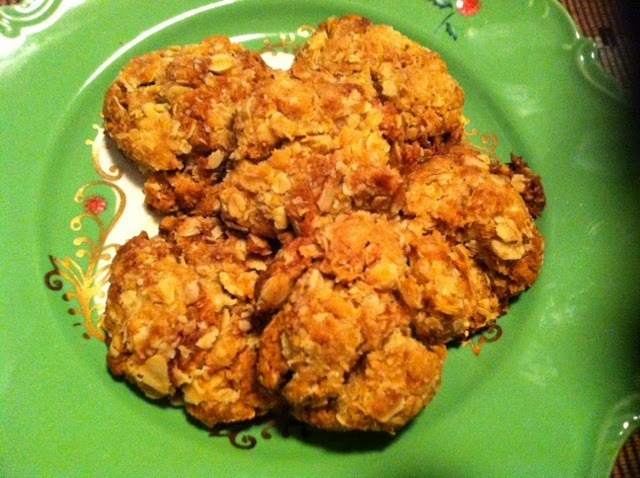 The recipe makes crunchy Anzacs - I like mine chewy. They tasted fine, but were just not what I am used to. Preheat your oven to 180 degrees Celsius and line 2 baking trays with baking paper. In a large bowl, combine the flour, sugar, oats and coconut. Make a well in the centre of the dry ingredients and pour in the melted butter and golden syrup, and stir the mixture to combine. In a small cup, combine the bicarbonate of soda and water, then pour it into the biscuit batter and stir to combine. Roll tablespoons of mixture into balls, place 2cm or so apart on the baking trays, and bake for around 15 minutes or until golden brown. Remove the Anzacs from the oven and allow them to cool on the baking trays. The recipe says you should get 26 Anzacs - I got 18. Life is rather like a tin of sardines - we're all of us looking for the key. This week is our second last French Fridays with Dorie seafood dish. Unfortunately, it comprises a rather oily fish concoction called Sardine Escabeche. I have to say that it is quite a gory process. I was prepared for it from the video, and wore food gloves to limit the mess. Still, filleting 12 little fish with all of their organs still intact was not exactly a pleasant task. Once the filleting was done, the rest of the process (flouring and shallow frying the sardine fillets, frying up some veges, adding a large quantity of oil to the veges and simmering, then pouring over the fish before chilling for 6 hours or so) was quite easy. Unfortunately, I do not understand the European love of putting large quantities of oil on fish. I can understand that back in the day, it was a means of preserving them, but in the era of modern refrigeration, I just don't get it. But then, I guess, some people really like oil-covered fish (see Salmon in a Jar). Thankfully, although this is definitely not a repeat dish for me, it tasted way better than salmon in a jar. It was pleasant enough for cold oily fish with vegetables - at least everything was pre-cooked. However, it still doesn't grab me. Margaret is giving us a touch of Asia with this week's Eating with Ellie, choosing Ellie's Asian Chicken and Vegetables in Foil. This dish comprises chicken breast fillets steamed with carrots, capsicum and shallots with an Asian inspired sauce, steamed in the oven in a foil packet, then topped with toasted sesame seeds and more shallots (oops, I put those in the foil packet). Unlike many of the other Ellie dishes, this one took more like 45 minutes to prepare and cook because of all the vegetable chopping involved. However, it is quite simple to prepare. I liked this dish, but it definitely needs more veges and some rice for a complete meal. To see what the others thought of this dish, visit the LYL section of the EwE website. I liked this dish because it was quick, simple and unfussy to make - a one pot wonder. I think it tasted best the next day when all of the flavours had had some time to meld. To see what the other WWDH cooks thought of tis dish, visit the LYL section of the website. Or if you want to try this dish yourself, the recipe is online here. Monday last week was my last Pilates class with our instructor, Stacey. She is a trained exercise physiologist, and found a full time job in her field, hence her reason for leaving. I am very happy for her and very sad for me - she is one of the best instructors we have had, and a very nice lady to boot. 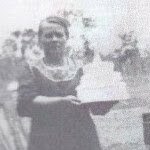 As you will know, I love baking cakes, so I couldn't let Stacey leave without baking her a cake. 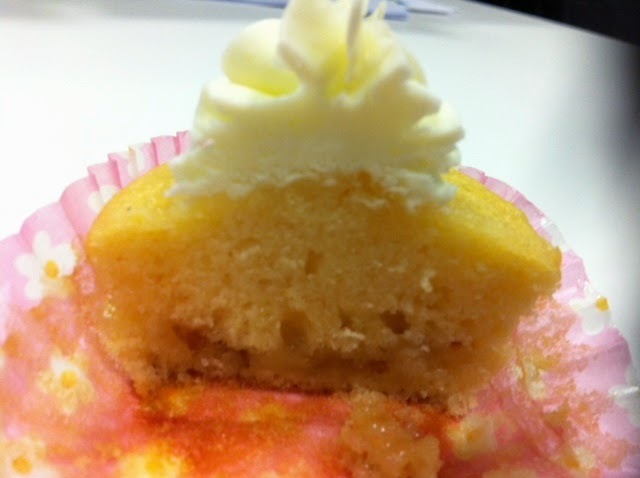 I chose Edd Kimber's Raspberry Ripple Cake from The Boy Who Bakes. That book has been around for a while, but I only acquired it late last year, and this was the first time that I had used it. If you don't have the book, a few people have published the recipe online, including here. I made a few adjustments to the recipe. Instead of three layers, I cut the cake batter recipe in half and made only two layers, which seemed quite substantial anyway. I also swapped out the Italian meringue buttercream (I personally hate Italian meringue buttercream!) for my favourite Primrose Bakery buttercream, but incorporated the same raspberry and white chocolate flavours that Edd used. Oh well. I hope Stacey enjoyed eating this cake - it certainly smelled amazing. When I made chocolates for Easter, I needed something to fill them with. I didn't have any cream so many of the usual fillings were out. By luck, I came across this recipe from Honey and Spice for Dark Chocolate and Roasted Hazelnut Spread - homemade Nutella! I was surprised at how easy and delicious this spread was. I will shamefacedly admit that I have been eating the remainder out of the jar - it is that good. Best of all, I know what's in it, which you don't with store bought Nutella. On our recent trip to Bendigo, we had a wonderful dinner at Masons of Bendigo, on the recommendation of my work colleague, Wayne. We had a sneak preview of Masons on our Food Fossicking Tour earlier in the day, and it certainly heightened our anticipation of dinner at Masons in the evening. Masons is very popular, and we were told on our tour that you have to book at least two weeks in advance. I had booked a month in advance, so that part was taken care of. As I mentioned in my post on the food fossicking tour, Masons has an open kitchen so that you can watch your meal being prepared. Masons prides itself on its use of local produce which it highlights in its fusion style menu. There are two dinner sittings at Masons - 6pm and 8pm. We went for the earlier sitting - I would be so hungry if I had to wait until 8! The bread was delicious, and the miso butter was devine. Then came the good stuff - Tim and I ordered two entrees to share. This was my dish of the night - just heavenly. Both mains were top notch, and we enjoyed them very much. It was all pretty good, but I think my favourite was the pannacotta. The service at Masons was very friendly and efficient, and Tim was chuffed that Nick, the owner, remembered him from the food fossicking tour earlier in the day. We would definitely return to Masons when we are next in Bendigo. Do you ever pick up a copy of the free supermarket magazines? If you do, do you ever make anything from them? I am a bit of a skeptic when it comes to supermarket magazines, because in some respects, they are one big ad for the products sold by the supermarkets. However, every now and again, you get a gem of a recipe that is worth making. The March 2015 edition of Coles magazine featured such a gem in the form of a beautiful mixed plum tart featured on the front cover. I was immediately drawn to the tart, and bought some plums especially to make that tart. You can find the recipe online here. I used Dorie Greenspan's sweet tart dough recipe for the base instead of the one stated in the recipe, because it is my go to tart dough and you don't have to roll it - it can be pressed straight into the pan. For the plum component, I used all yellow plums, which happened to be on special that week at Coles. This tart was very tasty - nutty, sweet and texturally interesting. If you have some fresh plums on hand, do give this beautiful tart a go - it is well worth it. I had a sense of deja vu with this week's French Friday with Dorie dish, as I had made Pork Roast with Mangoes and Lychees back in 2010. Granted, the photo back then was a little confronting with all that unrendered fat on the roast, but I enjoyed it very much. That meant that I was happy to front up for round two. This time, instead of using a pork roast, I used pork tenderloin medallions - faster and easier to cook, and less waste for one person. I used fresh mango and tinned lychees (fresh ones being out of season). I am a sucker for meat and fruit together so I loved this dish. On the day I made it, I couldn't eat it because I had been having a bad day health-wise, and the smell of the garlic and onions in the sauce made me feel nauseous. However, next day, I was right as rain and enjoyed every last drop of the sauce. This was once again a winner for me, and a dish that I would happily repeat - but I will have to be careful of the company I serve it to, because I can see from the Dorista forum comments that the fruit-meat combination (or maybe just the lychees!) is confronting for some. Visit the LYL section of the FFWD website to get the insight of the other Doristas on this dish. For Eating with Ellie today, Kayte chose Tuscan Kale Salad from p41 of Weeknight Wonders. To make it more palatable, I served it with yesterday's WWDH spaghetti, making it just another green leaf in the spaghetti. For today's Wednesday with Donna Hay, Sarah chose Spaghetti with Lemon, Capers and Rocket from p130 of Modern Classics. You can also find the recipe online here. This is a spaghetti flavoured with capers, garlic, chilli, lemon and parmesan. I used wholemeal spaghetti to make it a little healthier. I was not sure about the rocket through the pasta (in my case, mixed leaf salad), but it actually tasted quite good. I really enjoyed the clean, fresh flavours of this pasta. To see what the others thought of this dish, see the LYL section of the WWDH website. 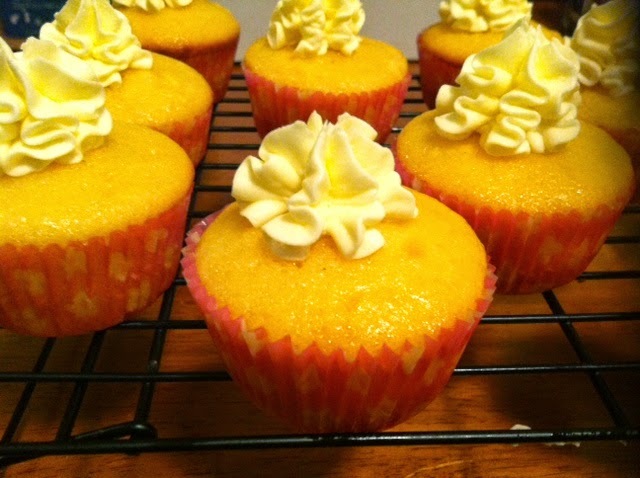 It's Tuesday with Dorie today, and I was excited by this week's recipe of Limoncello Cupcakes because I got to bake with limoncello. I had never heard of limoncello until I started blogging, and I bought a bottle of limoncello about 8 years ago that I had never opened - until now! There are quite a few steps in making these cupcakes. 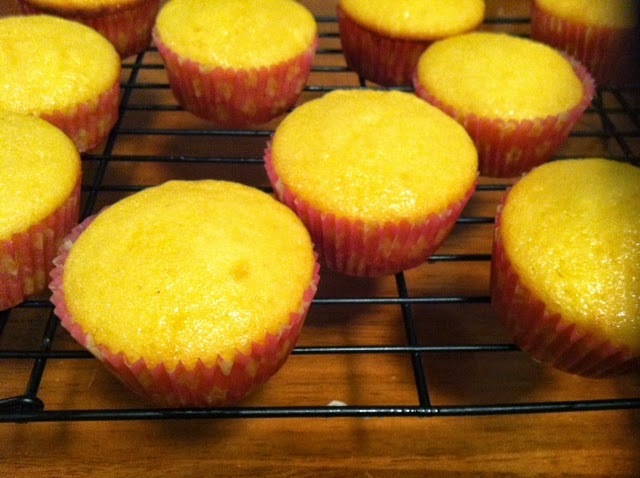 No mixer is necessary, but you have to make a syrup and a frosting as well as the cakes, and you fill the cupcake papers in two steps because they contain a jewel of marmalade in the middle (in my case, orange marmalade). I think these cupcakes are so pretty and elegant, and the syrup brushed on top while the cakes are still warm adds shine as well as flavour. The lemon flavour is subtle and not at all alcoholic. 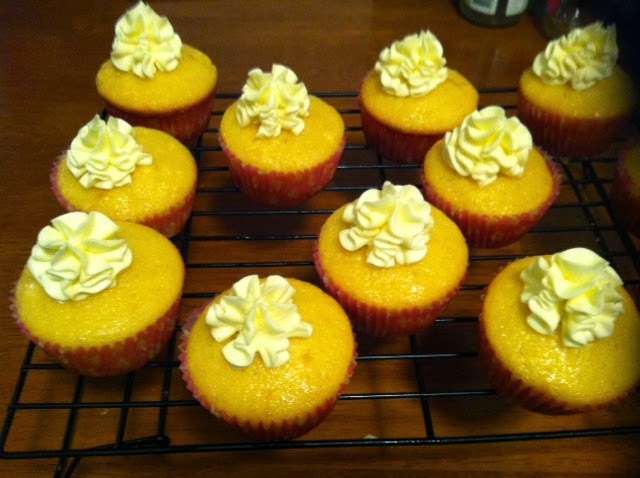 To see what the other Doristas made of these limoncello cupcakes, visit the LYL section of the TWD website. At my Pilates studio, they have a selection of magazines to help you pass the time while you are waiting for class. I always read The Womens Weekly, primarily for the recipes, but also for the amusing columnists. In the March edition of The Weekly, Julie Goodwin published a recipe for a Choc-Cherry Slice (bar cookies for my US readers). Being a huge fan of Cherry Ripes, I thought that this slice sounded just like a cherry ripe in slice form, so I memorised the recipe to make at home. I am so glad I made this slice. Don't get me wrong - it is very decadent and chocolatey, but for a treat, it is absolutely devine. Preheat your oven to 180 degrees Celsius. Grease and line a 19cm x 30cm slice pan. Melt the butter and chocolate together over a saucepan of simmering water. Beat the eggs in a stand mixer until thick and pale. Add the sugar to the eggs gradually, beating until the mixture forms ribbons. Fold in the chocolate mixture, then the cherries and the coconut. Fold in the flour and cocoa. Pour the mixture into the prepared slice pan, and bake in the preheated oven for 45 minutes or until cooked through. Allow to cool in the tin then cut into bars. 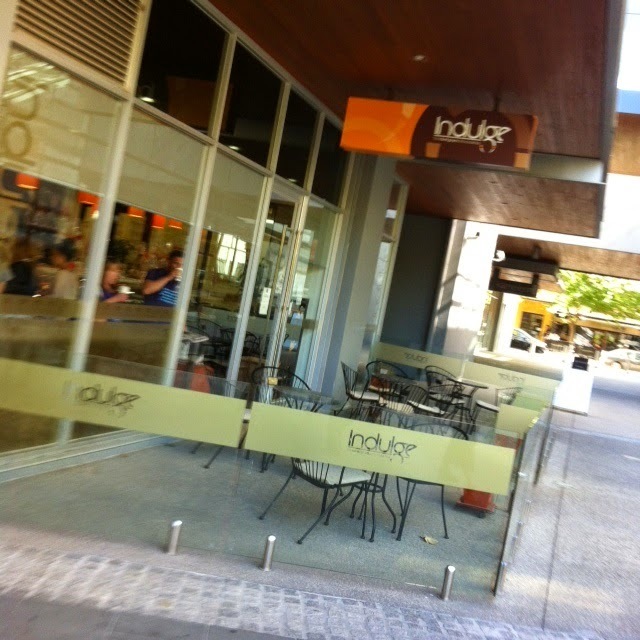 Recently, Tim and I went on a Food Fossickers Tour of Bendigo. The tour costs $75 per person, and starts at the Bendigo Visitor Centre. There, we met our guide, Sharyn (pictured above). The tour goes for approximately 2 1/2 hours, and is a walking tour, so wear sensible shoes and a hat. We were provided with some samples of breads, dips and olives, and I went back later to buy some spelt flour. We were treated to a coffee of our choice to drink with a platter of meats, cheeses and crackers, including a fabulous French brie. One of the owners of The Good Loaf, Laurie, gave us a behind the scenes tour of the bakery, and allowed us to see, smell and taste his sour dough starters, which he prides on making from scratch. We also tried two different breads - one sourdough, one corn sourdough. Masons has a seasonal menu utilising seasonal local produce, with many dishes designed to be shared. Both dishes were fantastic! We were also lucky enough to have a booking for dinner that night so that we could experience more of the wonderful food at Masons. In the cost of the tour, we received some samples from each establishment that we visited to take home. This was my favourite sample - everything was delicious. I loved the Food Fossicking Tour, and highly recommend it if you happen to be in Bendigo on a Saturday morning.